I am not going to lie. The Naturalist’s Notebook optional inner border that lies between the center and outer blocks is going to be a challenge. 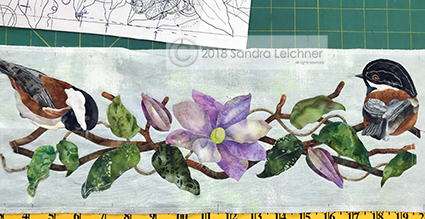 I am currently in the process of the applique now (see my Instagram “sandraleichner” for updates). One of the challenges depends on how you decide to attach the borders. I am appliqueing the border sections (top, right, bottom, left) separately and then will attach them to the center section (Jason’s Grasshopper). Once that is done, I will add the embroidery. Adding the embroidery at this stage will make it easier to square up and attach as one large section to the outer blocks. Some of the elements will lay partially on the background sashings between the blocks. 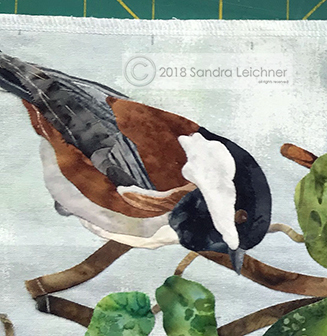 Some of the birds, in this case the top left Chickadee, will have its tail section overlapping that outer sashing background. The Chickadee has very small pieces that have to line up! 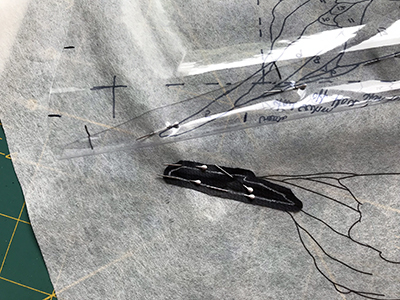 I trace off the section I am creating with an “Off the Block” technique onto Swedish tracing paper. 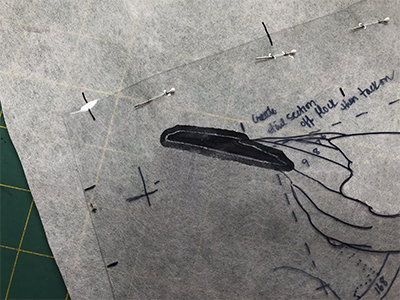 It is transparent, flexible and easy to sew through. 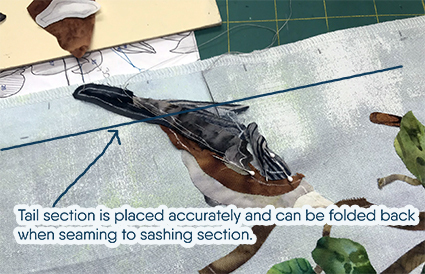 In this case, I am not creating the entire bird but only the tail section that I can fold out of the way while sewing the joining seam between the border and the outer block(s). I use my vinyl overlay (see my post about that here: Vinyl Overlay Method ) and place as normal over the tracing paper. Even though my lines are traced onto the paper, the overlay makes it a snap to get perfect placement. I line up the first piece under the overlay into position. 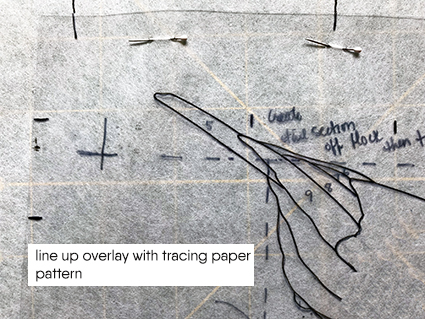 Carefully pull back the overlay and pin the piece in place to the paper. Continue until the necessary pieces are completed. 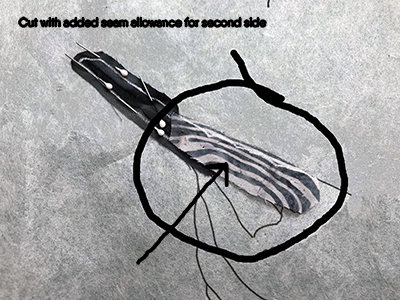 If you haven’t noticed yet, there is a VERY small piece at the uppermost edge of the tail area (see above picture). Uh oh! Don’t sweat it. Here is how you will handle that with ease. Look carefully and you will see my white “scalloped” outline. I have already appliqued the top straight edge (that is it!). But look how I have added excess fabric to the seam allowance at the bottom of the piece. Just cut the excess away leaving a small seam allowance and Voila!!! 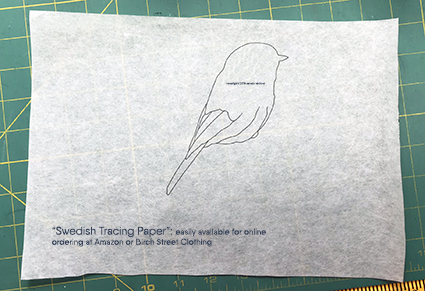 GENTLY..very gently, tear away that tail section from the tracing paper. 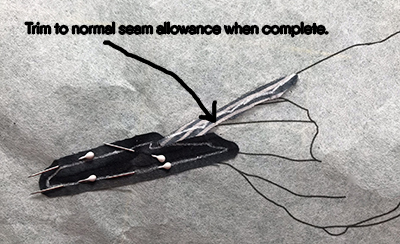 You can always trim it away but do not use the paper as a “background fabric” for stitching the applique in place. I basted down the lower right piece to the tail feather for stability. 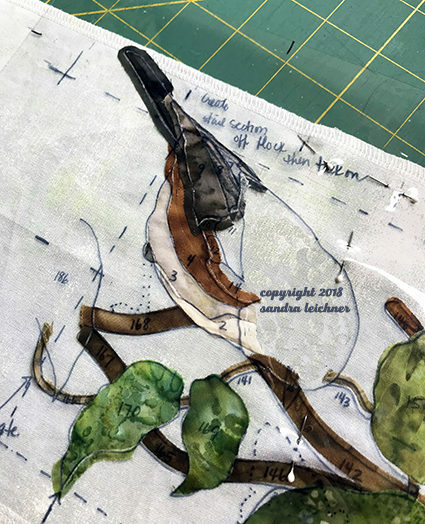 I place that tail section in place (in order) and stitch the remainder of the bird that falls directly within the border. I have drawn a line where the seam will be when I attach the outer blocks to this border. 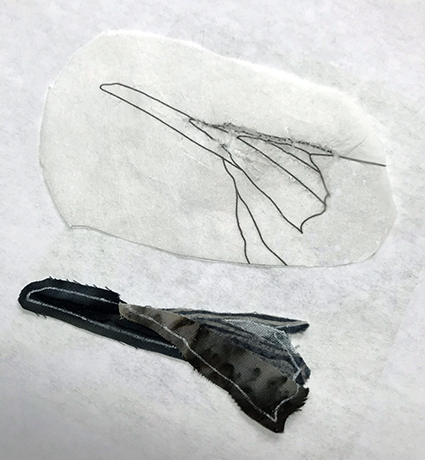 The tail section is free to fold back out of the way but more importantly, the entire bird is constructed and matches up. When the section seaming is done? 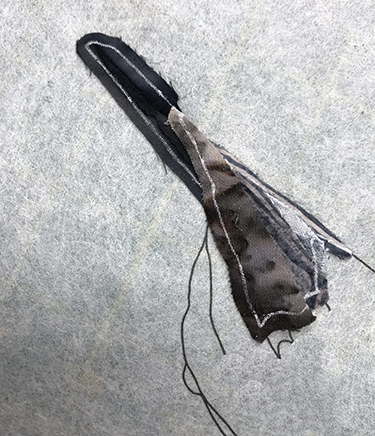 All I do is go back and stitch that tail section in place permanently across the seam. If I had to go back and match up those tail pieces later? No. Just no. uh uh. If you plan on adding this optional border, I would print this out as a reference so you have it handy. You can apply to this to other elements too. As I stated at the beginning, this is going to be a challenge but well worth it. For *just* the borders, one yard is enough. However, I am probably going to use more for the sashing background areas that are yet to come. I do not have those measurements yet! I haven’t got that far so I have no idea at this time what the amount will be. I promise I will share when I know that.